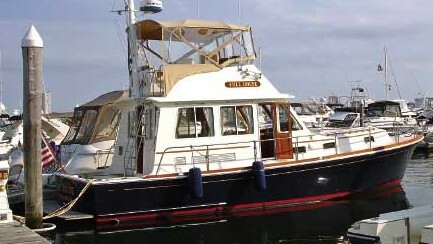 Grand Banks 42 Europa: Cruise aboard this traditional trawler, and you'll never leave home. We've all heard the old cliche that "You can't go home again." I don't think any of us really believe it until that first trip to visit our parents after leaving home, when we discover that our old room is now Dad's den or Mom's sewing room. The room is still there, the walls may even be the same color and the wallpaper may be unchanged, but it is no longer "our" room. That may explain why I always feel so comfortable when stepping aboard a Grand Banks boat. There is an unmistakable traditional "home-like" feeling shared by every Grand Banks product, no matter the size or layout. There are many other trawlers out there, and some may even look like a Grand Banks at first glance, but none of them feel quite the same. Somehow, Grand Banks manages to assemble bits of fiberglass and teak to create salty, yet elegant vessels unlike any others. 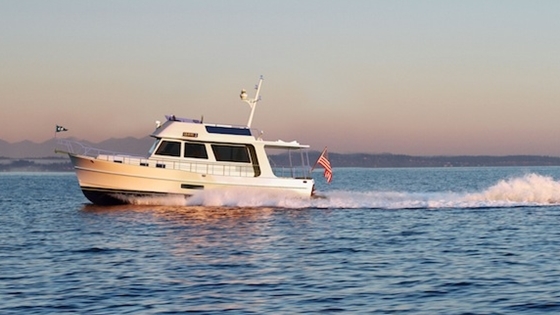 We tested the Grand Banks 42 Europa on a spring morning at Seattle's Shilshole Bay Marina. Walking down the dock on test day, the Grand Banks 42 Europa was easy to pick out. Hull #1491 was made available to us by Grand Yachts Northwest, and it was on its way to Bellingham, Washington to be outfitted for its new owners. Grand Yachts' Scott Blake was adding diesel to the boat's tanks for the cruise. The first things we noticed about the 42 were its wide sidedecks, and the cabin top's extension — on both sides and astern — that protected them. The side gate in the stainless steel railing allowed easy access from the fuel dock at Shilshole. A transom door and adjacent swim step allow easy boarding from lower docks. Teak caprails and an aft door are the only exposed varnished woodwork the owner will need to maintain, giving just enough of a warm traditional wood glow without requiring excessive maintenance. Teak decks — left in their natural, unvarnished state — circle the deck, although an optional skid-resistant fiberglass surface is available for the deck around the trunk cabin, forward. Personally, I would opt for the easy-care teak. In the aft deck, we found a typical lazarette access. Twin hatches with deep gutters and hydraulic-assist rams open up this space, where plenty of storage is available — along with convenient access to the rudders and steering ram. Forward of this is another access hatch, also guttered and hydraulic-assisted, with access to a mechanical area for water pumps and other systems. The area has a door between it and the engine room for easy access, allowing the maintenance team to reach mechanical gear without having to track through the boat's interior. 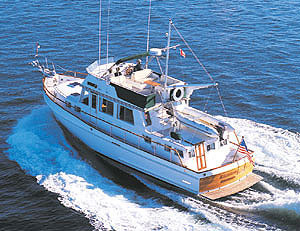 Grand Banks originally produced the 42 Europa from 1979 through 1991, then retired this venerable cruiser. When the company decided to reintroduce the boat in 1996, the Europa was built on a new, slightly larger hull. It is 6 inches wider and 6 inches longer, allowing for an enlarged forward stateroom and stairs to replace the former ladder to the flybridge. With numerous handholds and rails, it's easy and comfortable to move up to the 42's large flybridge. Here, you'll find plenty of room for entertaining and sun worshiping — and there's still ample space for dinghy storage. Back-to-back molded-in fiberglass seat consoles for the helm and companion hide plenty of storage — and a propane tank. Cushions for these seats are removable. Aft, there's room for a round table and four chairs or an optional L-shaped lounge. A dinghy davit will be required for storing the dinghy aft on the hardtop, because the old mast has been done away with on this model, in favor of a stainless steel radar arch. While purists may miss it, the mast's placement far aft didn't add much to the lines of the boat — and the new arch simply looks better. We entered the cabin from the cockpit through double sliding doors. The interior is typical of Grand Banks, with warm, satin-finished teak panels and joinery, teak parquet flooring and neutral-colored upholstery. The look is clean, inviting and timeless, adding to that "homey" feeling that all Grand Banks yachts provide. With a beam just over 14 feet, the 42 Europa is not the widest boat of its size range; and, with the wide sidedecks, we expected a narrow saloon. Surprisingly, the saloon feels larger than many found on bigger boats. With the galley forward, the saloon avoids a long, narrow feel. Two chairs opposite the settee can be moved around the boat's dropleaf table for convenient dining or gaming. Our test boat had an Ala-Mer d?cor package, which provides radiused cabinetry, and crown molding along the overhead. Contemporary amenities such as Corian countertops and VacuFlush heads have been added over the years, but the basic functionality of the layout remains unchanged. The large galley is augmented with a dish locker that's under the dash ledge. Three different compartments with lift-up covers provide compartmentalized cubbies — and they still leave a large surface for charts. A standard Norcold refrigerator is under the counter. 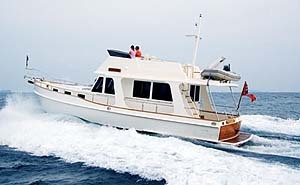 It is upgraded by Grand Banks with a teak door that has the classic look and latch of boats of 20 years ago. An access cover in the corner of the galley lifts up to reveal a metal-lined insulated cooler. It can be used as storage or an ice chest; however, owners can add an optional cold plate to equip it for additional cold storage. Drawers and cabinet space provide room for enough provisions and utensils to handle a long cruise. Down three steps and forward are the 42's staterooms. The master is forward and offers a queen-size berth. Owners who plan to spend a lot of time aboard may want to upgrade to a more substantial mattress. Under the berth, there's a bank of drawers. The top one is double-wide, making it large enough for full-size charts — or lots and lots of socks. Large stainless steel-framed portlights let in plenty of fresh air and natural light. Teak panels along the hull sides are done in the classic strip style — just as they are on Grand Banks' classic wooden boats. Two hanging lockers are on either side of the stateroom. The head compartment is accessible from either the master stateroom or the main passageway. The head's stall shower is roomy, and there is plenty of elbowroom around the VacuFlush head. The Corian countertop has the sink molded into it, and it offers plenty of room for toiletries. Bulkheads are finished with a smooth laminate for easy care. The guest stateroom can be ordered with either twin berths or a double berth running along the hull side. Our test boat had twins, which will work for guests and are ideal for children or grandkids. Power options for the 42 Europa range from a single 300 hp diesel to twin 375s. Our test boat had twin 300 hp John Deere inline six-cylinder diesels, which provided plenty of power. With its semi-displacement hull, the 42 Europa is capable of planing speeds — however, it also performs very well at hull speed. The boat's hard-chine hull is the same basic design that Grand Banks has used since building its first boat, although it has obviously enjoyed a lot of "tweaking" over the years to maximize performance. At 1,000 rpm, the 42 made 8 knots, and was barely sipping fuel. When we moved the Panaflex controls forward, the boat eventually topped out at about 19 knots. Interestingly, the noise level at the lower helm never got much louder, from idle to wide open throttle. The engine tone changed, but normal conversation remained possible at any speed. Probably the most surprising characteristic is this boat's stability and predictability. Handling at any speed feels the same. Even at 19 knots, the boat turns and tracks predictably, and always feels solid. Returning to Shilshole and docking the boat proved just how predictable and controllable the 42 Europa is. The boat ran straight on one engine with just a little rudder correction, but still spun with engines set in opposite directions. After I stepped off the boat, Hull #1491 continued on to its destination. I'm still not sure what it is that makes a Grand Banks feel like home, but I am sure that the 42 Europa — like other Grand Banks models — is a boat that deserves to be cruised aboard. For new owners who trade up to the 42 from a smaller Grand Banks, it's nice to enjoy the feeling that even if some things change, everything still seems like home on board. 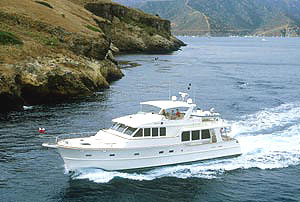 Teak flybridge deck and main decks; windlass with three-station controls; windshield wiper and washer system; VacuFlush heads; Panaflex controls; auxiliary generator; 12v/110v Norcold refrigerator; water heater; Corian galley countertops; laminated safety glass windows; teak valances. Air conditioning; inverter; exterior canvas package; holding plate refrigeration system. Hard-chine semi-displacement hull design; hand-laid fiberglass hull with epoxy barrier coat below the waterline; five-year hull warranty against blistering.